SQL is the dominant language for data analysis because most of the time, the data you're analyzing is stored in a database. And most analysis involves a lot of filtering, grouping and counting — actions that SQL makes very easy. But sometimes you need to go beyond pure SQL. Some analyses require complex business logic or advanced statistics. While you can do advanced statistics in pure SQL, it's often a lot simpler to use Python. This post is about starting that transition. If you're already comfortable with SQL, and want to get started with Python, this is a look into some of the valuable transformations you can build. We'll look at how to calculate linear regressions using Python, after using SQL to create our dataset. We'll use a sample video game database and uncover the relationship between how many times frequent players play the game, and how much money they spend in-game. There are many Python libraries that help with data analysis. 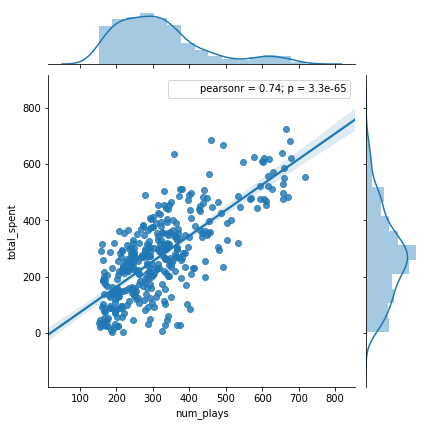 We'll start with seaborn and use the easiest way to make a linear regression, a jointplot. As a bonus, this plot type also comes with histograms. Easy! 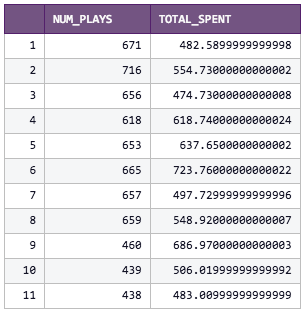 As we could have predicted, players who play more also spend more, in general. 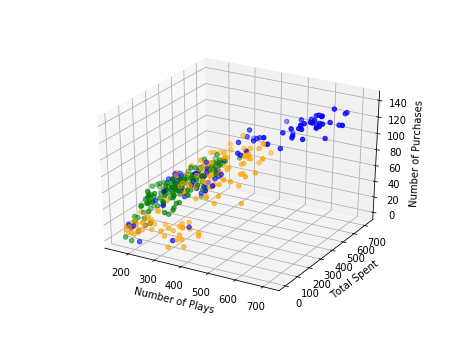 However, scatter plots aren't the right plot type to show dense clusters of information since they hide density — many data points could be hidden behind a single dot. 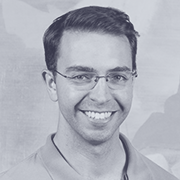 In these cases, hex binning can tell the data’s story more effectively. With hex binning, the plot area is divided into equally sized hexagons, and the color shading of each hexagon is based on how many data points fall within that hexagon's boundaries. Why hexagons and not another shape? There are three regular shapes that can tessellate, or cover a surface without gaps or overlaps, in 2D plots. Squares and triangles are the other two. Hexagons are generally preferred for binning because they are closest to a circle (compared to triangles and squares). Circles are most representative of a "bin" because circles have the minimum distance between their borders and the center point among 2D shapes, which minimizes outliers in the bin. With this plot type, it's easy to see where the density of data points varies, which we couldn't tell from the scatter above. Segmenting out the data was informative! 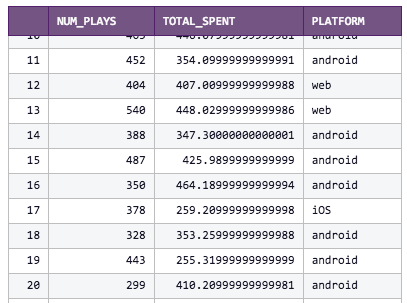 Web and iOS players have very different play count and spend distributions. Sometimes it's helpful to plot a third variable to shed more light on the distribution. In our case, we'll include the number of purchases a player has made to tease out if we're looking at few large purchases vs. many small purchases. In the user_spend CTE we'll add count(1) as num_purchases to the select clause and include that column in the final SQL output as well. While they look neat, 3D plots are often useless if they aren't part of an animation or have some way of letting users move the perspective. Without that, a 2D rendering of a 3D plot can make it very difficult to see where the points actually are in the space. 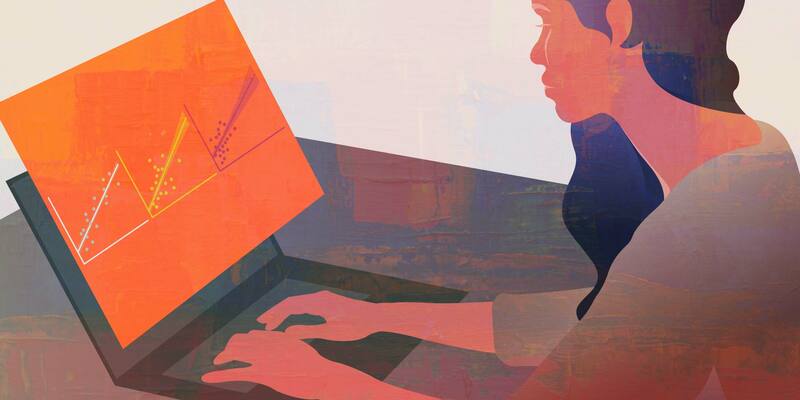 With just a few lines of Python, it's easy build on your SQL expertise to generate analyses that benefit from advanced statistics, especially when those statistics are inconvenient to calculate in SQL. Another benefit of using Python to visualize statistics is that you're not tied to whatever built-in visualizations are available in your SQL environment. Of course, this is just the beginning. Python makes it easy to include complex business logic, more advanced statistics or more advanced visualizations. Periscope supports dozens of R and Python libraries made for data analysis and visualization, ready and waiting for your next data project!